We are engaged in offering high grade Air Curtain to our precious clients. This product is manufactured using optimum quality components and cutting edge technology. Our offered range is tested on various parameters for ensuring its flawlessness. Further, this product is available in different technical specifications and can be customized as per the precise needs of clients. Clients can avail the offered range at market leading prices. 20 SWG for blower housing. Interior Finish: anti rust treatment primer paint. Fan & Motors: the multi blade forward curved centrifugal type al. Fan dynamically balanced is driven by extended motor shaft. Pharmaceutical plants, textile mills, cement plants; and all those industries where surrounding air contains high dust concentrations such as coal and light mines, steel plants, foundries cement plant and other similar industries. With the aid of our well developed infrastructural facility, we are able to offer our clients a wide assortment of Industrial Cooler. The offered cooler is manufactured by utilizing premium grade components in compliance with the industry approved quality standards. Further, it is offered in various sizes and specifications that suit the clients specific requirements. Furthermore, our clients can purchase this range from us at reasonable prices within stipulated time frame. It is tested on well defined parameter in order to deliver defect free range. 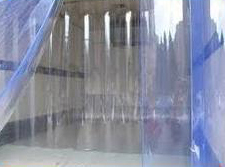 We are devotedly engaged in manufacturing, trading, exporting and supplying a qualitative assortment of PVC Curtain. This curtain is manufactured with utmost precision under the observation of our experienced professionals. In addition, the offered range is tested on various quality parameters to ensure its flawlessness. Owing to its unique features, this curtain is highly appreciated by our clients spread all across the nation. 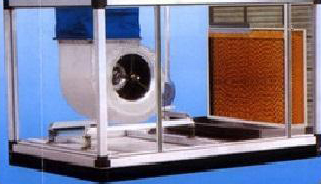 Our prestigious clients can avail from us an excellent quality array of Dust Free Unit. This unit is manufactured using advance methodologies and equipment as per the set industry standards. Moreover, our quality controllers inspect this range on diverse quality parameters in order to ensure delivery of defect-free product at clients end. Available in various technical specifications, clients can avail this unit at rock bottom prices. Sant make blowers are dynamically and statically balanced on fie make computerized balancing machine. The motor used is drip proof mounted on specially designed adjustable motor base. Electrical supply normally is 3 ph / + / -415 volts. Filter section channels are designed for 50 mm thick expanded aluminum mesh washable pre filters with easily removable facility. Direct driven heavy duty didw forward curved (dynamically and statically balanced) and for quite operation. GE/crompton make motor is provided for trouble free performance. Models are available from 1200 cfm to 400 cfm. All casing consist of heavy gauge galvanized finish with powder coting. Washable hdpe air filter is provided with standard units. Structure: Sructure of Airwasher is made up of Extruded Aluminum Section of high quality. Capacity Available : 2000 to 40000 CFM with single Blower & 4000 to 80000 CFM with Single & multiple blowers. Base Frame : The total assembly is mounted on a horizontal member of heavy steel channels. Outer Covering : Constructed in Pre-Coated Sheets. Inner Covering : Constructed in 24 SWG GI Sheet. Water Tank : Constructed in GI with Frp coated/SS. Blower : Dynamically Balaced Forward Curved, DIDW Type Make ETIP / Imported. Electric Motor : Three Phase, TEFC squirrel cage induction motor of standard makes (Crompton, ABB and Kirloskar etc.). Drive Pulley : V-Groove with/without Taper Lock hub. Pump : Monoblock make Crompton /ABB/ Havells/ Kirloskar. Filter : HDPE/Aluminum/GI Mesh Filter, Micro Vee, HEPA as per requirement. Pipe Fittings : PVC/GI piping with all Necessary fittings such as float valve, quick fill, overflow & drain ports. Base Frame : The total assembly is mounted on a horizontal member of channels. Fan Section : Constructed in GI/SS Sheet with Inspection Doors. Wet Section : Constructed in GI/SS Sheet. Pump : Monoblock make Crompton / Kirloskar. 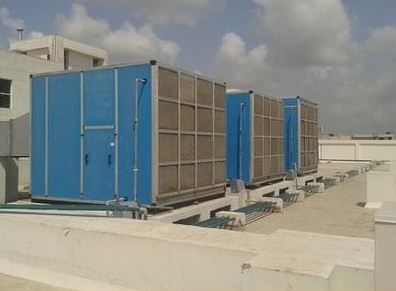 D.P.Engineers Cooling System manufactures state of the art, highly reliable, low maintenance, energy conserving Air Washer/ Air Cooling System in various capacities. The new, innovative designs guarantee predictable performance, long life expectancy and near zero maintenance. 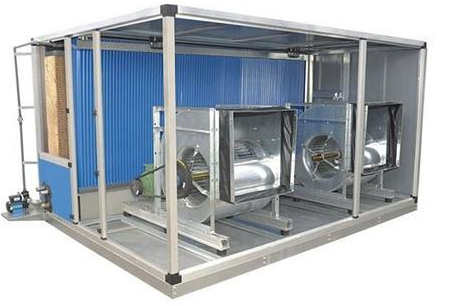 These units are available from 3000 CFM to 100000 CFM, plus and can be designed to accommodate optional accessories such as louvers, dampers, eliminators etc. The Air washers are especially suitable for cleaning extracted air, which has a high affinity to water and must be separated due to the demands of environmental protection. Primarily this air washer is used for cleaning extracted air containing pure chromium, and enables the return of the primarily separated aerosoles back to the process. A further field of application for this air washer is the increase in the usage duration of the collecting main liquid, due to the primary separation of the impurities. The air washer´s mist separator is constructed equipped with a quick locking mechanism. The continuously fed double spray nozzles are positioned on lances, which are flanged onto the casing. This makes maintenance or an inspection in the shortest time possible. The removal direction of the mist separator units, depending on the air direction being left, right or upwards is adapted to the local conditions accordingly. In Double skin construction the structure is made of hollow aluminum profile with nylon corners and panels are made of 0.6 mm thickness pre - coated outer sheet and GI inner sheet. The panels are insulated with injected PUF (38kg / cubic m.) / EPS slabs / Kini Foam. in Single skin construction the structure is modular type, made of GI hollow profile and are mechanically bolted with Top and Bottom Tray. panels are made of 18g. Or 16g. (Thickness varies according to the size of unit). The Blowers used in Unit are imported or indigenous and is centrifugal type Forward Curved for normal static pressure, Mounted on Rubber Isolators for smooth and quite operation. Sant make Blowers are Dynamically and Statically balanced on FIE make computerized Balancing machine. D.P.Engineers Air Curtains are available in various models ( both horizontal & vertical) and in five different velocities. They are suited for door openings starting from 2.5 Ft. Wide and in velocities ranging from 13 mtr/sec to 25 mtr/sec and above. These velocities are divided into five different model for the convenience of our privileged customers. We supply these SS Air Curtains in Baddi, Nalagarh, Solan, Ludhiana, Jalandhar, Amritsar, Mohali, Zirakpur, Chandigarh, Parwanoo and other region of Punjab, Haryana and Himachal. We are among the distinguished manufacturers, suppliers and exporters of Ductable Unit Floor Mounted in the industry. The offered units are made available by us in several specifications to meet the diverse requirements of the customers. These units are designed by domain experts and are widely demanded by malls, offices, institutes and suchlike establishments. The unit is manufactured as per the customers requirements. Manufactures High Quality Single Skin Air Washers as per coustomer requirement under the brand name D.P.Engineers. Water Tank : Constructed in GI /SS. Blower : Dynamically Balaced Forward Curved, DIDW Type Make Enviro Tech Industrial Products / Imported. Drive Pulley : V-Groove with / without Taper Lock hub. Filter : HDPE/Aluminum/GI Mesh Filter, Micro Vee, as per requirement.